Avana Skyway Apartments offers Studio, 1, & 2 bedroom apartments. Please select a unit that you like, fill out your name, number, and email, and you will be redirected to our quick and convenient online application. Not seeing what you're looking for? Availability changes every day, if you tell us what your needs are we’ll call you when availability changes. All room dimensions are approximate and may vary by apartment. Distinguish yourself at Avana Skyway Apartments. Choose from our studio, one, and two bedroom apartments for rent in San Jose, CA. Each of our luxury living spaces offers an open-concept floor plan and spacious layout so you can arrange your furniture to your liking and customize your space. The highlight of our apartment homes is the gourmet kitchen. Prepare chef-inspired dinners for family and friends in your kitchen with modern quartz countertops, high-end Energy Star appliances, and contemporary espresso-stained cabinetry. Our homes are finished with handsome hardwood-inspired flooring and designer light fixtures, a neutral modern background to your unique aesthetic. With open-concept floor plans and gourmet kitchens, our living spaces are built to impress at Avana Skyway Apartments. We offer south San Jose, CA, apartments for rent in 22 distinct floor plans ranging from 458 sq. ft. – 1,500 sq. ft. 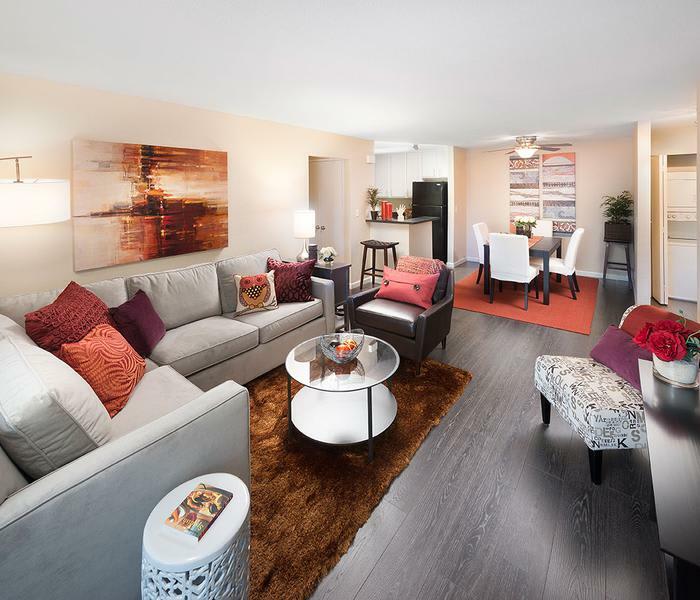 Select your favorite from our spacious studio, one, and two bedroom layouts. In addition to our modern interiors, our apartment homes provide a cozy private balcony or patio, a perfect outdoor space for a small vegetable garden or a glass of wine after dinner. 22 Unique Floor Plans Ranging From 458 sq. ft. – 1,500 sq. ft.
Find your fit at Avana Skyway Apartments. Call today to set up a walkthrough of our San Jose, California, apartments for rent in Silicon Valley.